Music teachers both new and established, take note – SoundTree has recently launched an incredibly tech-savvy website that offers unprecedented and accredited professional development opportunities. SoundTree’s new Institute for Music Educators is one of the most impressive and ingenious uses of online learning technology for Music Teachers that I’ve seen to date. The site offers online training and support twenty-four hours a day, seven days a week. In the fast-paced and jam-packed world that music educators are navigating today, there can be little doubt that having this type of professional development opportunity available will be a boon for all of them. Through SoundTree’s affiliation with the University of the Arts, both graduate credit and continuing education credits are available to those taking advantage of the myriad of courses offered through the institute. The SoundTree Institute is also tightly integrated with the TI:ME curriculum and offers a number of TI:ME approved courses that will count toward obtaining any of the TI:ME certifications. 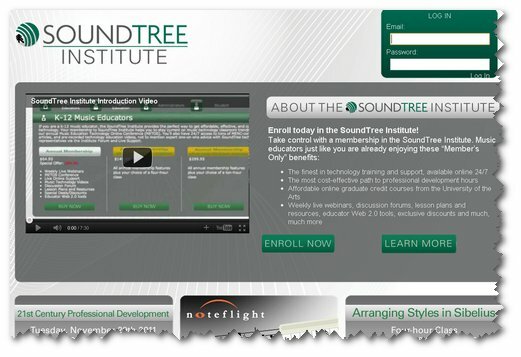 Interestingly, many of the TI:ME certified instructors and TI:ME curriculum developers are currently offering courses and webinars through the SoundTree Institute -just another reason to consider joining this innovative institute. SoundTree is noted for the comprehensive expertise in music-related technologies specifically for Music Educators. Their expertise as a music technology provider is unparalleled and their staff includes a number of noted music education and technology experts such as Dr. Jim Frankel, Robin Hodson, as well as a boasting a “who’s who” of expert music education and technology clinicians and authors. In the traditional, non-virtual-related “world” of professional development, you may find SoundTree and their staff presenting at such noted places such as the Conn-Selmer Institute and NAfME (MENC) headquarters. You can also find SoundTree presenting and attending numerous Music Education Conferences across the country throughout every year. They are deeply rooted in the industry. Soundtree recently launched another ground-breaking professional development opportunity for Music Educators in 2010 with the advent of the Music Education Online Technology Summit (METOS). METOS is literally an entire conference themed around Music Education and Technology and is held online in a virtual environment complete with a keynote speaker, multiple online sessions and clinics to select from and even holds “break-out sections” –other than not being there physically -there is not much difference between it and the more traditional music conferences. METOS has successfuly completed its second conference and has now become a part of the SoundTree Institute. I hope that you take the time to consider all that the SoundTree Institute has to offer music educators and take advantage of the incredible professional development and learning opportunities available through it today.